The following are a set of Pyramid rules developed by Polaris. They're based on a set of draft rules created by Radcliffe's player. Thanks to Sawyer, Stavrian, Davis, and Andrea for their helpful suggestions, and special thanks to Damon for creating our awesome court! 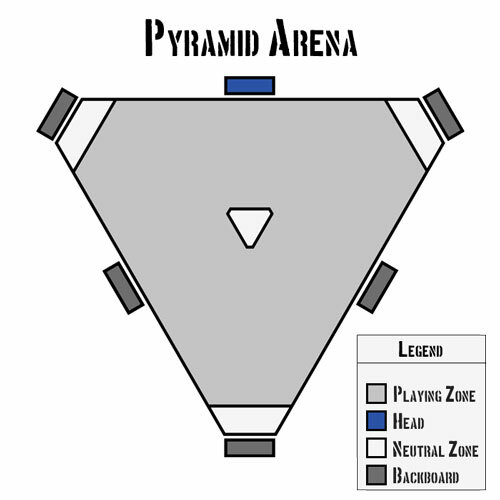 Diagram of a Pyramid arena. Pyramid is played on a triangular court twelve feet by twelve feet by twelve feet in size. Teams consist of three players when possible, though they can consist of two (or even one) if need be. The object of the game is to score points by throwing a ball into a goal mounted near the top of a six-foot post, called the "head." Professional games last for four quarters of ten minutes apiece; however, pick-up games usually play to a set number of points. On offense, the player with the ball can take only three steps before he must act. He can choose to pass the ball to a teammate or bouncing it back to himself ("banking" off one of several six-foot backboards mounted along the edges and at the corners. If the rules allow (see the Two-Touch Rule below), he may also attempt to shoot. Players often attempt to use their three steps to reach one of four Neutral Zones (NZs) on the arena, from which location they can complete their action without hindrance. On defense, players can tackle the ball-carrier or attempt to block/intercept a shot on goal. They may also attempt to foul their opponent. To streamline the game, we recommend that players OOCly announce their actions and +roll for the result before posing what happens. This allows the interaction between one set of offensive and defensive players to finish in two poses and a fresh interaction between a second set of players to begin. And while it's certainly possible for one set of players to dominate a round of play (a player may win the face-off, bank the ball, and shoot it — all opposite the same defender), please be mindful of the fact that your teammates might want some action too! Athletic Passing; shooting; tackling; muscling an opponent out of the way. Reactive Blocking; evading or dodging an opponent. Alertness Recovering the ball in a scrum. A skill bonus is given to those PCs who have Pyramid or another sport as background skills. Unless otherwise noted, skill bonuses apply to all rolls. A player with the Pyramid background skill receives a +1 bonus for her first dot, a +2 bonus for her second dot, a +3 bonus for her third dot, and so on. She does not receive a skill bonus for other physical sports she knows. A player without the Pyramid background skill can still receive a bonus if she has dots in another physical sport (like Melee, Running, Boxing, Soccer, Rugby, and the like). She receives a +1 bonus for the first three dots she has in that sport and a +2 bonus for all subsequent dots. A player can only receive bonus dots for her highest-leveled physical sport (for example, a player with Boxing 6 and Cross-Country 4 would only receive a bonus of 1+1+1+2+2+2 = +9). No wonder Anders was a star! 1. Face-Off: The game begins with a face-off, where one player from each team makes a contested Athletic roll to determine which side receives possession first. Much like basketball, a team relinquishes possession to the other team once it scores. 2. The Two-Touch Rule: After a face-off or a score, the ball must be touched by at least two players (from either team) or be successfully banked to the same player before a shot can be taken. Consider the following sequence of plays to understand Two-Touch in action. The game begins and Blue Team wins the faceoff. Blue 1 must pass or bank the ball before a member of Blue Team can shoot. Blue 1 botches the bank. Red 2 intercepts the ball. Red 2 may shoot the ball. Blue 1 botches the pass. Red 2 recovers in the ensuing scrum. Red 2 may shoot the ball. Blue 1 botches the pass. Blue 2 recovers in the ensuing scrum. Blue 2 may shoot the ball. Blue Team scores. Red 1 receives possession. Red 1 must pass or bank the ball before a member of Red Team can shoot. 3a. Passing: To pass the ball, a player +rolls Athletic; a defender from the other team can oppose with Athletic (to represent a tackle) or Reactive (to represent an attempt to block). This may result in several pass attempts as a team tries to give the ball to its best shooter. If the passer wins, he completes the pass successfully. If the defender wins, he intercepts the ball and takes over possession. If there is a draw, the ball is loose and both teams proceed to the scrum. 3b. Banking: To bank the ball off one of the courtside backboards, a player +rolls Reactive; a defender from the other team can oppose with Athletic (to represent a tackle) or Reactive (to represent an attempt to block). If the banker wins, he retains possession and may now shoot. If he draws or loses, the other team takes possession. 4. Shooting: A player with the ball may attempt to score if the two-touch rule has been met. As usual, he does this by +rolling Athletic versus a blocker's Athletic or Reactive. If the shooter wins, his team scores a point and the other team takes possession. In the event of a draw or a loss, the other team takes possession without any point being scored. A player who wins the face-off may act again, though he cannot shoot. A player who successfully banks the ball may act again with no restrictions. A player who wins possession off a turnover or from the scrum may act again with no restrictions. Players who manage to get to one of the arena's four NZs can complete their action without interference. Mechanically, this attempt takes the place of a typical shot or pass. Players can get to an NZ using one of two methods. 1. Body Check: A player being guarded can attempt to ram his defender out of the way with a contested Athletic roll. A win means his action — whether a pass or a shot — automatically succeeds. A loss means he turns the ball over to the defending player. A draw means both teams proceed to the scrum. Note that when +rolling for a Body Check, neither party receives a skill bonus! 2. Evade: A player being guarded can attempt to weave away from his opponent using his superior dexterity and reflexes using a contested Reactive roll. A win means his action — whether a pass or a shot — automatically succeeds. A loss means he turns the ball over to the defending player. A draw means both teams proceed to the scrum. Note that when +rolling for Evade, neither party receives a skill bonus! 1. Scrum: When the ball comes loose due to a Body Check or Evade attempt gone wrong, players from each team not involved in the original play can attempt to jump on the fumbled ball. In game terms, one player from each team makes a contested Alertness roll, with the winning side receiving possession. If the roll results in a draw, continue rolling until one player wins. Note that when +rolling in the scrum, neither party receives a skill bonus! 2. Foul: For ease of play, the rules only permit defensive players to attempt cheap shots on their opponents. There is no such thing as an offensive foul. Two categories of fouls exist: "minor" and "flagrant." A minor foul grants an extra +5 bonus to the contested roll in question. If the defender wins, the ball is loose and teams proceed to the scrum. If the defender draws or loses, the offensive player retains possession and completes his action successfully. The only exception is if he was in the process of shooting: he must make a simple Athletic roll with skill bonus to make the shot go in. A flagrant foul grants an extra +10 bonus to the contested roll in question. If the defender wins, he earns a turnover. But if the player draws or loses, the other team receives a free point! All foul bonuses stack with skill bonuses. Unless noted, all +rolls include the applicable Skill Bonus. Condition: Two-Touch Rule must be fulfilled before a Shot can be taken. Success:   Pass, Bank, or Shot succeeds. Condition: No skill bonuses apply. Condition: Players rolling cannot have been involved in the original play (Exception: one-on-one game). Condition: Only defenders may foul. Must be declared OOCly before the offensive player +rolls. Success:   Ball is loose; Scrum. Failure:   Opponent retains possession; declared action succeeds automatically (Exception: if shooting, +roll Athletic). Draw:      Opponent retains possession, declared action succeeds automatically (Exception: if shooting, +roll Athletic). Condition: Only defenders may foul. Must be declared OOCly before offensive player +rolls. Failure:   Opposing team wins free point. Draw:      Opposing team wins free point.